Events company Spy Games has launched a 10-day mission at The Mall in Athens after being briefed by the venue’s managers to provide shoppers with a thrilling new experience. 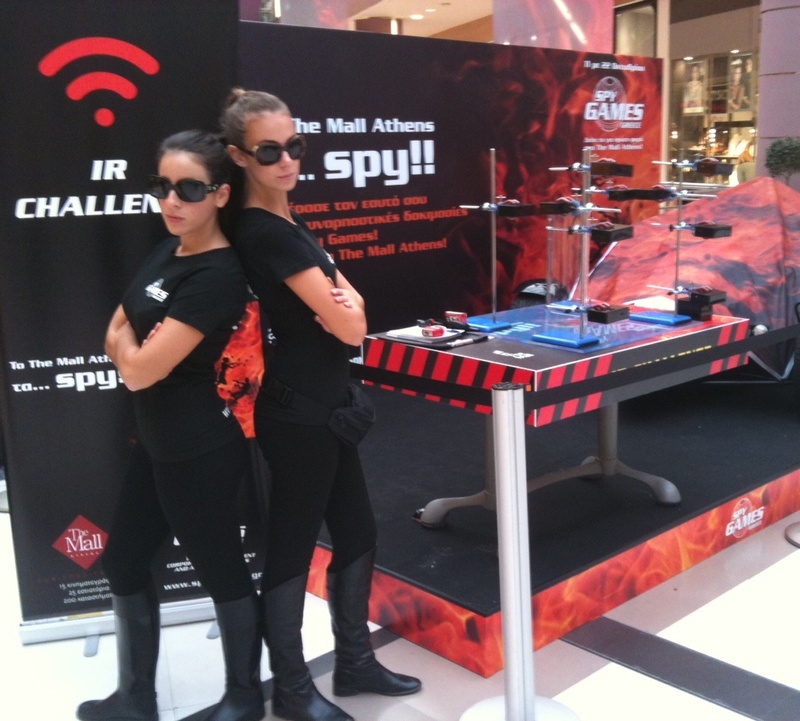 The Mall, which is the Greek capital’s largest shopping complex and one of the biggest in Europe, is offering Spy Games activities for adults and children from 11th – 21st October 2011. During this period, shoppers will be putting their spy skills to the test in a series of specially-devised challenges including dodging laser alarms, an exhilarating ‘shoot out’, code breaking and safe cracking. Trainee agents will need courage, determination and agility to prove they have what it takes to follow in the footsteps of James Bond, Spy Kids and MI:High. On successful completion of each mission, aspiring spies will receive the Spy Games stamp of approval in their spy passports. Completed passport books can then be exchanged for Mall-ars (The Mall Dollars) to purchase gifts from a dedicated area within the centre. The Spy Games challenge is open between 4.30pm – 8.00pm Monday to Friday and from 11.30am – 9.00pm on Saturday and Sunday. Spy Games founder and managing director Dave Thomas said: “We’ve staged many events in many different countries over the past 10 years, but this is the first time we’ve brought Spy Games to a shopping centre. Logistically, there were some particular challenges but we’ve overcome those to create something very special. It’s going exceptionally well so far, with great feedback from customers and from The Mall’s management team, who wanted a new way to draw people in. “This is certainly something we’ll be looking to replicate in more shopping centres over the coming year, both in the UK and overseas. The experiential element of shopping is becoming an increasingly important factor, particularly when times are tough for retailers, and we can bring something new to that. UK-based Spy Games was founded 10 years ago and set up a new office in Greece in 2010. Spy Games is the world’s leading events and training specialist in espionage activities and is passionate about delivering high quality corporate programmes that entertain and excite. Established in 2001, Spy Games delivers team building activities, product promotions and corporate entertainment for clients that include Asda, Barclaycard, BSkyB, Carphone Warehouse, Coca Cola Enterprises, Diageo, Ernst & Young, FHM, GSK, KPMG, Microsoft, Ministry of Defence, O2, Panasonic, Red Bull, Red Letter Days, Serco Group, Siemens, Shell, Sony, The Home Office, Unilever, Virgin, Vodafone, Wagamama and XBOX. Using its extensive planning and co-ordination skills and expertise, Spy Games can deliver international events anywhere in the world and in almost any venue from coaches and trains to hotels, Bedouin tented camps or even the client’s office! Flexible in its approach, Spy Games offers both off-the-shelf programmes and tailor-made events and training packages that meet a client’s budget and objectives. Presented by highly trained professionals, Spy Games brings to life the exciting world of international espionage. High-resolution Jpeg images are available on request. This press release was distributed by ResponseSource Press Release Wire on behalf of Friday's Media Group in the following categories: Entertainment & Arts, Leisure & Hobbies, Media & Marketing, for more information visit https://pressreleasewire.responsesource.com/about.